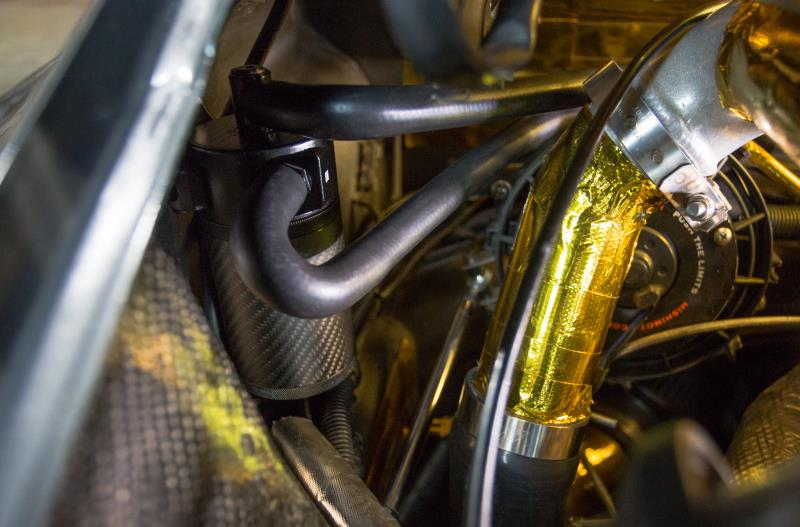 Get your Mishimoto Carbon Fiber Baffled Oil Catch Can Today! In the world of aftermarket modification, there are two directions to go in with any upgrade. Form or function. Some might not care if the part looks like a work of art just as long as it performs, and vice versa. That’s an owner’s prerogative, and maybe driving around a box that hits the 300 whp mark and sounds like a grizzly bear is all you need. Other enthusiasts prefer a flashy set of wheels and a few want the best of both worlds, style and efficiency, which isn’t always available. It’s not easy to get that perfect blend. That won’t stop Mishimoto from trying, though. We’re aiming to create a little gray from the black and white of performance against aesthetics all while protecting your engine from blow-by. The business of defending the intake tract of any engine leans toward the side of function. Catch cans are installed to serve as a reservoir for that murky mix of fuel and oil aiming to infiltrate the intake manifold, and sometimes even mount somewhere out of sight. It’s no surprise that aesthetics doesn’t play a huge role in catch can designs, because as long as they keep your top-end safe, who cares what they look like? Well, we do, and I’m sure we’re not alone. The idea of adding some style to the catch can came a few years ago with our release of the compact baffled oil catch can. You could say that we’ve always had an opinion on their outward appearance. To make sure that we nailed the form aspect for our newest addition to the Mishimoto catch can family, we of course started with the form and shape of it. Our engineer borrowed some styling tips from our current baffled catch can design, but stretched it out a bit. Now, the capacity has increased to 7.4 fluid ounces and has room for our baffle system. Using our bank of 3D printers, we were able to bring our new design to life, borrowing styling cues from our previous designs to create a sleek new look for collecting blow-by. The main focus for the aesthetics on this catch can is the material. That silky black and gray weave is one of the most sought-after textures in the realm of automotive modifications, so we wanted to combine that with defending the top-end components of your vehicle. Our carbon fiber can is the real deal. 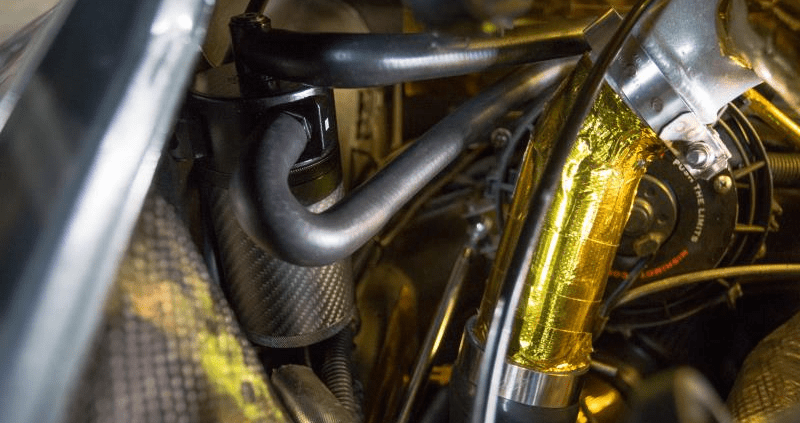 We could have easily wrapped any one of our catch can designs in a sheet of carbon, but we wanted to take it to the next level, and so manufactured the can’s bottom from full carbon fiber. This can not only looks the part, but also helps shave a few extra ounces for the weight-conscious racers. Our patent pending design is also the perfect marriage of high-grade aluminum and carbon fiber. While we would love to be able to make the entire piece from carbon, we still need some aspects to remain aluminum. For example, our quarter-turn lid, which removes the hassle from checking the collection level and servicing the can, is aluminum. If a quarter turn still sounds like a pain, then there’s always the integrated drain plug for use with our petcock valve drain system. Style knows no bounds. The idea for modifying any car is to inject the driver’s personality into the vehicle. We know this just from peeking out into the parking lot of Mishi HQ. Knowing this, we didn’t want to limit our carbon fiber catch can to just a few select makes or models, but rather design it to be adaptable. Our unique bracket design opens a world of possibilities for mounting this small bit of carbon under your hood. With two possible orientations, plus the provided mounting hardware, the possibilities are almost endless as to where this can could be placed. Also, if rubber hosing isn’t your style, our inlet and outlet ports are designed to accept -10AN fittings to allow for the use of stainless steel braided lines. Sure, it looks great under the hood, but does it hold up? Well, our patent pending carbon fiber catch can design is more than just a pretty face. Our engineering team started from the ground up with the design of this can to make sure it was still up to the task of blow-by collection. You might be saying to yourself, “But wait, there’s a reason why catch cans are made from aluminum and other types of metal.” Air pressure is something that any catch can has to be able to withstand, especially when it comes to boosted vehicles. We thought the same thing when we started this endeavor, so naturally we did the typical Mishimoto thing and tested it. Setting up an automated test rig took the stress out of testing the strength of our full carbon can bottoms. The testing software is programmed to operate as a pressure regulator to cycle test our cans up to 100,000 cycles, making sure they’ll last a lifetime. We mounted our test cans under a protective shield, since one of these popping could be catastrophic. We’re happy to report that we weren’t sweeping up any bits of carbon fiber after our testing. Aluminum or any sort of metal will have no issue holding up to any kind of pressure that the PCV or CCV system throws at it. Carbon fiber, while notorious for being a lightweight alternative for aluminum or steel, doesn’t take too well to bending. In other words, flexing or expanding the material could result in a failure, and the last thing we wanted to do was sell you a catch can that could burst. Using our first run of production samples, we assembled an automated testing rig to pressurize our full carbon fiber catch cans up to 100,000 times, torture testing our carbon material to a limit that it would never see installed in line with the PCV system. We’re happy to report that all our guinea pig cans are still intact. So, it can handle the pressure, but can it catch? I mentioned before that this design was stretched out to fit a new baffle system. The automotive industry isn’t the only one that needs to separate air and oil, or air from some sort of other substance. One of the more common methods to perform this sort of segregation is by employing cyclonic separation. We figured if oil refineries can use this on a large scale, why couldn’t we use this on a smaller scale in line with contaminated crankcase pressures? If you know anything about cyclone separators, this doesn’t look like your traditional cyclone separator. We did run tests on a scaled-down version of the traditional baffle and found the best results came with a shortened baffle and bladed slots. Our engineers adapted this concept to create our cyclone baffle, utilizing computational fluid dynamics (CFD) to design the blades that support the condensation of oil and fuel vapors for collection without causing a significant pressure drop in the system. Clean air can then flow freely up the center of the can and through the safety net of our high-flow filter material, which we incorporated to snag any rogue particles of fuel or oil. There are some dirty jobs out there in the world. The catch can serves one of the grimier duties there is when it comes to the automotive realm. That doesn’t mean it has to look just as gritty. Our appreciation for both sides of the Form vs. Function divide helped us fill the gap with the tensile strength of carbon fiber, making a black and white issue appear more like a sleek gray weave.